"But what would we most yearn for if we were locked away in dark little pens and stalls and ignored or shouted at and treated like garbage? I for one would yearn most for the sun and the cool water and the breeze and fellowship of my kind. I would yearn to be seen, feeling that if others only saw me they would try to help." Harley could not know that it would be his grossly overgrown feet that would be his salvation. When his kind-hearted but neglectful owner tried to cut them – it was his screams that alerted a neighbor and caused her to call the authorities. When they arrived – they found an overwhelmed woman and her forty cats along with Harley in a windowless trailer. The trailer was immediately stamped with an orange sticker stating that it was condemned as unfit for human habitation. It was a matter of days to find a new home for Harley before he would be put down. 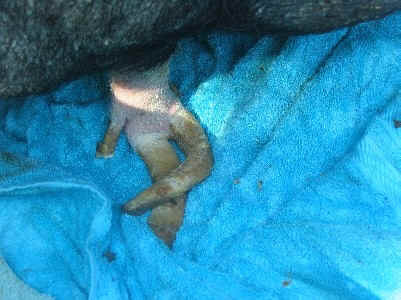 The zoning officer contacted Gallastar and asked us if we could help this pig. What we found shocked even us. Although we had seen our share of pigs who like Harley had eyes covered with layers of fat – had found tusk cutting into their cheek and feet almost as long as his before – Harley had something we had not been witness to – he had a matt of cat fur and dried food that covered his entire nose. A foomanchu type mustache hung down from where his nostrils must have dripped from the awful ammonia and other fumes that permeated the tiny trailer. Had it not broken in half in the center – he might have suffocated and certainly could not smell anything. I knew we had made the correct call when we had opted to do the transport ourselves instead of taking up an incredibly generous offer to help tran sport him. This pig required very special handling - especially in the terrible heat. And so he rode home in the air conditioned car with four of his young cat friends who provided him much comfort. When he moved into his new shady paddock – he found the sun and basked in it – he tasted the green grass and savored it – he found his own kind and realized what it was that he had yearned for in the dark all of those years. There remain behavioral scientists and differently degreed folk who argue that our animal brethren lack emotions and that animal consciousness is closed. They conduct painful and cruel experiments on them in an effort to prove that animals do not have thoughts as we know them or feel or suffer in the same way that we do. This thinking rationalizes the suffering inflicted in the name of science and food and sport the suffering and loneliness and pain so many billions are subjected to each and every day. This idea that animals are so differently from us in their emotional intelligence is total nonsense to those of us that spend our lives closely intertwined to theirs. No one could have denied the absolute joy that our two pony sisters- Surprise and Heaven -expressed when being reunited after an absence of nine years. When Heaven was in the hospital for colic surgery three years ago – she would look out the window and call for Surprise who was doing the same for her at home. This went on for days. 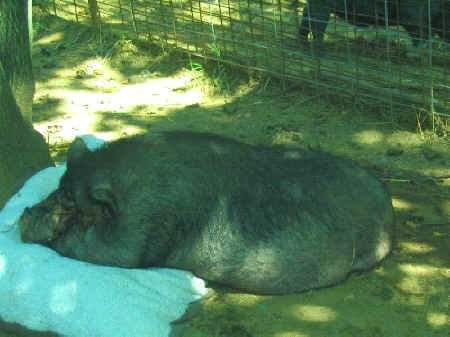 We have found our Ranger pig with his tusk caught in a fence out in the summer sun with huge biting flies all over him. His constant companion Bart stood in the baking sun right beside him with tears rolling down his face. When Bart was taken ill – it was Ranger who never left his side until he was well. When it was time to administer shots – Ranger had to be locked out because he would fiercely defend his little buddy. Our mother pigs who have been allowed to live out their lives with their offspring will always be found sleeping with them at night and even after many years family units are seldom far away from one another when out in the pasture. When one of our half grown baby goats strays from the herd or slips through a fence – it is not only his mother who calls frantically for him but siblings and goat playmates as well. They are a community of souls who squabble and enjoy each other and no doubt mourn when one is lost. Harley has no way of knowing that all of the procedures happening to him on his first day here would help to give him a wonderful new life. He was missing his kitty friends and the woman who had sat by him watching television for hundreds of nights. She had sent his favorite pillow and the reaction to it when we put it down was nothing less than remarkable. You could see the absolute relief for him that something of his former world was still with him as he sniffed over and over the pillow before lying contentedly down on top of it. He still sleeps next to it as if it were another pig but gradually he is spending time lying next to the fence where his friend from the King George Rescue – Curious George – lies by to give him companionship and be a friend. As we do – Harley will gradually let go of the old and the familiar and learn to adjust to the new life that he has been given. The pillow will probably remain a source of comfort. Now we could conduct experiments and put in another pillow or try and remove all traces of scent but that would be an insult to Harley and to our understanding of these sensitive and intelligent creatures. There is no doubt to us what is taking place and why. With his simple action of placing himself on the comfort of his own pillow, Harley speaks loudly against this notion that he is nothing more than an unthinking organism responding to a stimulus. Some scientists would argue this and refuse to see the obvious and that is because the truth makes them uncomfortable as it should. The truth is, that like us, Harley needs comfort and security and a sense of home in an uncertain time of his life. As was my last day before Christmas vacation was over this year engulfed by the King George farm animal seizure and rescue – the very last two days of summer vacation were dedicated to the transport and transformation of Harley. His cat fur matt moustache was trimmed and his nose once again able to breathe in fresh air and root in the soft dirt. His tusk was cut so that he could turn his head without having it jab into his cheek. Chris Grover – our wonderful local vet – was out to trim his hooves. Getting this done and settling him in took up the whole day. I returned from my trip into town to buy mouse and goat food just in time to feed in the dark once again. Gone was my fantasy of a new pair of shoes and possibly even a new outfit - such as most of my colleagues would be sporting as they all returned tanned and rested with chatterings of vacations and beaches and Europe. For me it would be the usual frantic morning feeding and throwing on of whatever was clean and handy. When it was my duty to officially share my summer exploits in our first staff meeting at school – I kept my unpolished shoes tucked under my chair and just mentioned my internship with at the Institute for Autism and our therapeutic riding summer camps. I kept to myself the boa constrictors in the bathroom, the delivery of the parrots to Regan International Airport for their trip to the sanctuary in Arizona, my incessant search for affordable housing for all of the rescued feeder mice, the late night blowout of the front tire on our truck on a rainy and busy interstate in Pennsylvania as we delivered the foreclosed sanctuary farm pigs to Catskills Sanctuary in New York, losing our beloved Dot Com after driving the entire night to get her to the University of Tennessee Vet School in Knoxville. Few of my fellow teachers would understand the triumph and satisfaction of Harley and his pedicure. There will be enough talk as our paraplegic mouse, Pocket, travels back and forth with me each day. But I will share it with you because I know you understand. Two people cannot do this alone and we want to share his story with you and thank you for all of your support and well wishes. 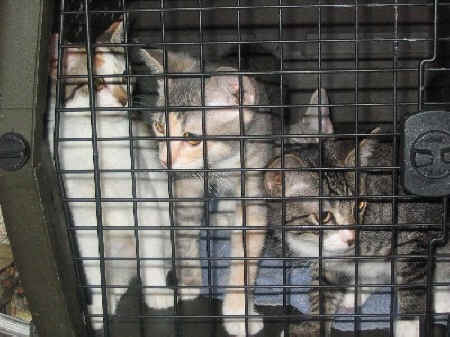 Here are the four kittens that we took out with Harley. They are up for adoption to approved homes and will be spayed/neutered and fully vetted. Please help us find homes for these little ones. We do not know how many if any of the other cats will be saved but these ones have been and deserve a wonderful home now. Harley really loved them and I bet you would too.